While the San Bernardino Massacre by Muslim immigrants and their progeny has been swept under the rug by the Islamist sympathizers in the press and subsequent terrorism by another Muslim child of Muslim immigrants in Orlando, significant events have emerged from the San Bernardino Massacre; the immigration bureaucracy, namely several senior employees of U.S. Citizenship and Immigration Services (USCIS) acted to aid and protect participants in the Muslim terrorist attack. This was no surprise to this writer. USCIS, like parts of the legacy Immigration and Naturalization Service (INS) are deeply sympathetic to aliens, terrorist, criminal, or non-terrorist alike, and will act to protect such aliens from arrest and deportation. An immigration official who stopped Homeland Security agents from arresting the alleged gun supplier of the San Bernardino terrorists the day after the attack, and then lied about it to department investigators, is to receive an award for her work. Irene Martin allegedly prevented armed officers from detaining Enrique Marquez, who was scheduled to be interviewed alongside his Russian wife Mariya Chernyk, a government report has stated. Yet despite her deliberate obstruction, where she seemingly blocked five armed Department of Homeland Security agents, she has been nominated for the Secretary's Award for Valor. Irene Martin, former Field Office Director for the San Bernardino Field Office of USCIS, obviously Asian or Hispanic, clearly has an agenda, and that is protecting illegal aliens, alien terrorists, and Muslims from the few enforcement actions the Obama Regime continues to allow, all thanks to cucks like Paul Ryan. The dead mostly white Americans in San Bernardino don't matter to her. She is on an ideological jihad against America. Similar to that of James T. Wyrough, Field Office Director, San Jose Field Office, USCIS, who brought Salvadoran gangbangers to the United States under the guise of asylum and refugee status. But the real problem will be with USCIS. The management is overwhelmingly in support of illegal immigration and the illegal aliens who are in effect their “customers.” USCIS has decided it is not a law enforcement agency, but a service agency. The management at all levels is politically corrupt and will approve any benefit for aliens—even if it is illegal to provide that benefit to an alien. It needs to be cleaned out from top to bottom. Before you think this was just one rogue employee, there was a wider conspiracy involving Martin and three other USCIS senior managers. In fact, Martin engaged in a conspiracy to obstruct justice, two serious Federal felonies, one, 18 United States Code (USC) 1510, Obstruction of a Criminal Investigation, and, importantly, 18 USC 371, Conspiracy, while protecting the San Bernardino terrorists, as well as making false statement to the DHS OIG Special Agents when she was interviewed in violation of 18 USC 1001, False Statements. Conspiracy because Martin acted under the instructions and protection of her superiors at USCIS. The field office director again called the district director who notified the regional director, who notified an associate director in Washington, who met with USCIS lawyers. The report supplies names for none of these people. So, it was three other USCIS officials who aided Martin in obstructing a Federal criminal investigation, which makes the offense a conspiracy. A conspiracy of four USCIS senior managers to prevent the arrest of a terrorist involved in a major attack on the United States. Note that the report from John Roth, Inspector General, Office of Inspector General (OIG), Department of Homeland Security, did not name any of the conspirators in this major crime for some strange reason, undoubtedly to protect the guilty. However the other names of the conspirators are a public record. First, the District Director for the Los Angeles District Office, which overseas the San Bernardino Field Office, is Susan Cuda. The other unnamed official in the OIG report is Carolyn Muzyka, Regional Director, Western Regional Office, USCIS, Laguna Niguel. Along with the as yet unidentified USCIS official in Washington, DC, these four actively obstructed and refused to assist the much lamented ICE SVU in its search for the Muslim terrorist Enrique Marquez, who provided the weapons used by the Muslim terrorists Syed Farook, child of immigrants, and immigrant Tashfeen Malik. Note the appearance of the three women who were identified in this incident of support for terrorism. 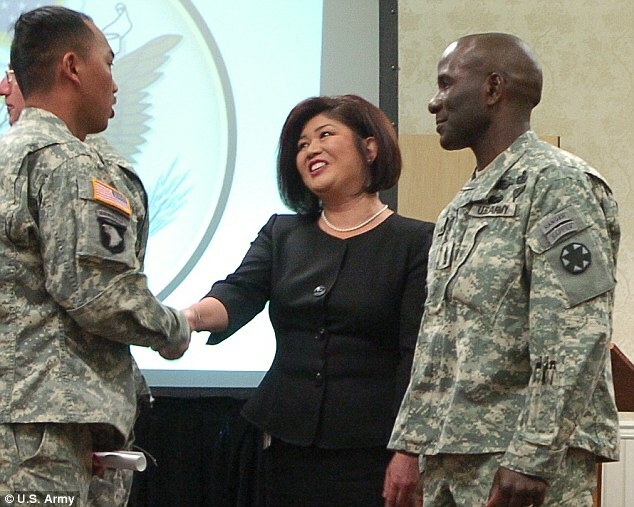 All three are long serving bureaucrats from the legacy INS, now ensconced in USCIS. They represent a type that the legacy INS and USCIS hire, unattractive women with a chip on their shoulders, a hatred of the men from the Border Patrol, Investigations, and Deportation offices that dominated the old INS. In USCIS they are feeling their oats, running a rogue government agency more concerned about protecting aliens and terrorists than defending America from the dangers of fraud, terrorism, and illegal immigration. Yet, Martin remains in office, in fact promoted and looking at an award for valor for protecting a terrorist from arrest. Jeff Carter, chief of media relations for USCIS, told FoxNews.com late Monday that "to his knowledge there is no further investigation into Martin," and her transfer become acting deputy district director was planned before the audit was released. Note that transfer to Acting Deputy District Director is a promotion, not a lateral move, and though an acting position, serving in an acting position enhances one's career with valuable experience and a resume padder. Furthermore, if Martin serves more than 90 days in an acting position, she will then be entitled to be paid at that position's pay grade, in this case a General Schedule (GS)-15, while she is currently a GS-14. And Martin will be doing this on a detail assignment, as her place of work in San Bernardino, while the new assignment is in Los Angeles, enabling her to receive housing and per diem payments on travel status, e.g. free hotel and living expenses. Similarly, Cuda has been temporarily assigned as the Acting Director for the Vermont Service Center, and will be enjoying a summer in New England courtesy of the U.S. taxpayer, all expenses paid, including hotel and per diem. Similarly, the position is a temporary promotion from Senior Executive Service SES-1 to SES-2, and she will receive the higher pay if she serves temporarily more than 90 days. And, to date there has been no response from the U.S. Attorney's Office for the Central District of California on criminal prosecution of Martin, Cuda, Muzyka, and the anonymous DC bureaucrat, interestingly headed by another woman, Eileen Decker, who fits the profile of the unattractive America hating harridans who infest the Democrat Party. Just guessing that the as yet unnamed DC bureaucrat is of the same type. The good news is that a President Trump can prosecute them all, as the crimes are well within the five-year statute of limitations.